On February 2-3, 2019, we saw 8 teams from the Island, Lower Mainland, and Alberta duke it out at the Duncan Island Savings Centre for the 2019 Senior Women’s BC Indoor Championship. It was a competitive weekend full of close matches and intense battles resulting in an all Vikes final. The Vikes Alumni and the University of Victoria Vikes went head to head to determine which generation was the best. Both team played hard but ultimately the young guns at UVic squeaked out a 2-0 win over the Alums. Third place went to the Island Wildcats, who edged the University of Calgary Dinos in the bronze medal game. The UVic Vikes battle the Vikes Alumni in the Championship game. 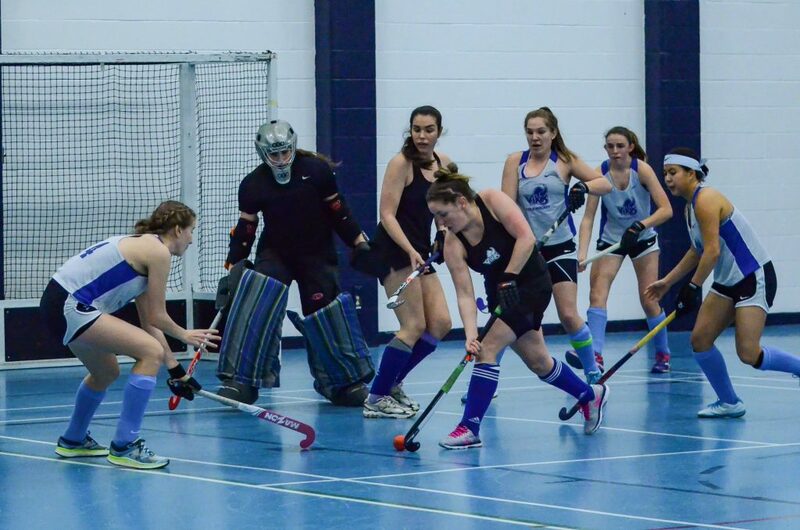 Field Hockey BC would like to congratulate all participating teams for a great weekend of indoor hockey! We are thrilled to see this tournament growing, as the tournament increased by three teams this year including the out-of-province U of C Dinos. We’d also like to thank Brenda Lockhart who ran another excellent tournament and Wendy Stewart who took the tournament umpires under her wing. The combination of these two helped propel this tournament to new heights and we are excited to see what the future holds for the growing game of indoor hockey in BC! Posted in NEWS, Tournaments and tagged bc indoor, field hockey, field hockey bc, tournament, women's field hockey.